Pittsburgh is truly one of the great American cities and that’s reflected in its cultural diversity. This diversity is reflected most beautifully and sweepingly in its Catholic churches and awesome eateries. But there’s just so much depth and beauty in Pittsburgh, that one article isn’t able to cover it all. Here are even more churches and eateries you have to make time to go see and experience in Pittsburgh. Sacred Heart parish is something of a wonder. Father Alek Schrenk thinks it’s the most beautiful parish in Pittsburgh. What say you? Check out their mass times and ministries here. After mass, head over to Noodlehead for some eats. Inspired by street markets in Thailand, get ready for an amazing selection of noodles and noodle soups. Bring cash, though, as no cards or checks are accepted (they do have an ATM, though). Check out their hours and menu here. St. Mary’s overlooks the Gold Triangle of Pittsburgh and the view is breathtaking. The parish is amazing, too! Started in 1873 as a mission of another parish, St. Mary’s was officially established as a parish in 1877 and the current building was dedicated in 1897. Find out more about the parish and their mass schedule here. After mass at St. Mary’s, head over to Shiloh Grill for a unique take on American pub food. With food names like “Britney Spears” (chicken strips) and “Polish Church Basement Pierogies” you know you’ll find nothing but amazing and fun food here. Check out their menu! The beautiful Neo-Gothic parish of St. Philip’s was first established as a mission parish in 1839 and then established as its own parish in 1874. The current church building was dedicated in 1906. When the parish school was opened in 1915, the pastor invited the Sisters of Charity to run it and they have ever since! Look up their mass schedule here. 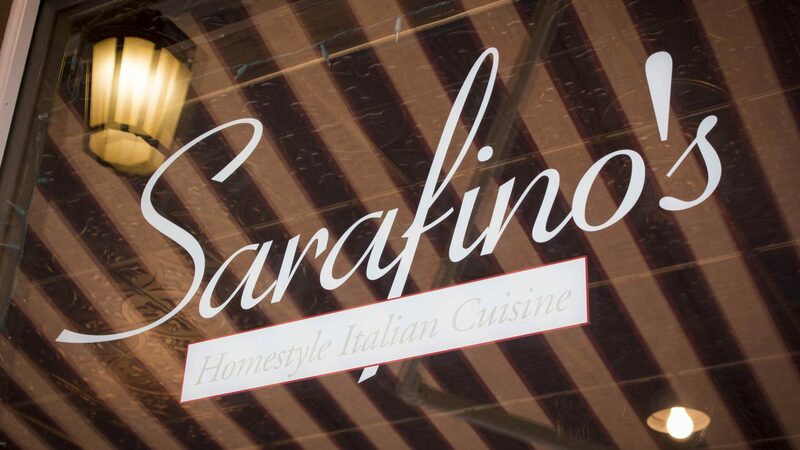 A trip to Crafton wouldn’t be complete without a meal at Sarafino’s. Serving high quality, home style Italian food, it is not to be missed! And it’s all family-run and uses family recipes. Delizioso! Check out their menu and history here. Point Breeze is a beautiful community in Pittsburgh that’s hard not to fall in love with. But add in Sunday Mass at St. Bede’s and you’ll fall head over heels! Check out their mass schedule and other info on their website. After Mass at St. Bede’s, head over to Point Brugge Café and enjoy some moules fritas, among other delicious Belgian-inspired foods! Browse their menu here. St. Elizabeth Ann Seton parish was first formed in Pittsburgh in 1992 as a collection of older parishes. After a flood that caused damage to many of the SEAS buildings in 2004, the new parish was dedicated in 2011 and blends much of the old aspects of the parish and history with new elements. Find mass times here. Close by, you’ll find Bakn a, you guessed it, bacon themed restaurant! Bakn serves breakfast, lunch, and dinner and almost everything on the menu has bacon included in some way. It’s tasty, it’s inventive, and it makes sure you never tire of their favorite ingredient: bacon. Find their menu and hours here. Briefly, when there was a Diocese of Allegheny, St. Peter was the Cathedral for that diocese. The Diocese of Allegheny was absorbed into the Pittsburgh Diocese, though, and St. Peter’s is not the cathedral (that would be St. Paul). However, you don’t want to miss this gorgeous church. Find mass times and other information here. After worshiping at St. Peter’s, you can get a bite to eat at Peppi’s Sandwich Shop. So many sandwiches! Since you’re in Pittsburgh, you’ll have to pay tribute to a Pittsburgh great, Ben Roethlisberger, and try Peppi’s #7, the Roethlis “Burger”. It’s a mammoth sausage and burger sandwich topped with a fried egg and American cheese. Check out their full menu here. As the Church breathes with two lungs, you must take in Holy Trinity Ukrainian Catholic Church. It is a beautiful parish and familiarizing yourself with an Eastern Rite is a glorious idea. Find times for Divine Liturgy and parish events here. Refurbished from Carnegie’s old post office, the Carnegie Coffee Company brings a wonderful array of brews, including Lavazza, which is a favorite in Italy and a leader in fine espresso. They also serve breakfast and lunch! Perfect spot for some midday grub after Divine Liturgy. Find out more about CCC and their menu here. St. Mary parish was originally established in 1852 as a German parish as a split-off of St. Joseph parish where both Germans and Irish attended…and fought. It ceased being a German parish in 1992, however, and is now a territorial parish serving the residents of Sharpsburg. Don’t miss this beautiful landmark church! Just a short drive from Sharpsburg to Aspinwall, you won’t want to miss Sunday brunch at Cornerstone Restaurant! Serving fresh up-to-date food in a friendly, relaxing atmosphere, the food is phenomenal. Also, they have a Lenten menu every Friday during Lent. How cool is that?